Austrian candidate Udo Landbauer serves as deputy chair of fraternity responsible for publishing anti-Semitic songs. The far-right candidate in an Austrian state election was under pressure Tuesday after a magazine report about song texts celebrating the Holocaust and other Nazi atrocities. According to the Falter weekly, Udo Landbauer of the Freedom Party (FPOe), which is in the national governing coalition, is deputy chair of a student fraternity behind a songbook containing the texts. According to the weekly, the lyrics of one song reads: "In their midst comes the Jew Ben Gurion: 'Step on the gas, old Germanics, we can make it to seven million.'" Six million Jews were killed in the Holocaust during World War II. David Ben-Gurion was the first prime minister of Israel. Other songs pay tribute to the Condor Legion, the Nazi unit responsible for the bombing of Guernica in the Spanish Civil War, as well as paratroopers behind atrocities in Crete in World War II, Falter added. The allegations came ahead of an election in Lower Austria on Sunday. Opinion polls put the FPOe in third place -- as in national elections last October -- on between 16 and 21 percent. An FPOe spokesman told the Austria Press Agency that Landbauer, 31, "has nothing to do" with the song texts, and that the fraternity was preparing a new songbook without the texts concerning "this disastrous time." If, as Falter suggests, the book was re-printed in 1997, then Landbauer was 11 years old at the time and "not even allowed to ride a bike on his own," the spokesman told APA. But Bernhard Ebner, the head of the centre-right People's Party (OeVP) in Lower Austria, said the allegations were "unbelievably serious" and needed to be "completely cleared up." The center-left Social Democrats (SPOe) said Landbauer should resign immediately, a call echoed by the liberal NEOS party if the claims turned out to be accurate. 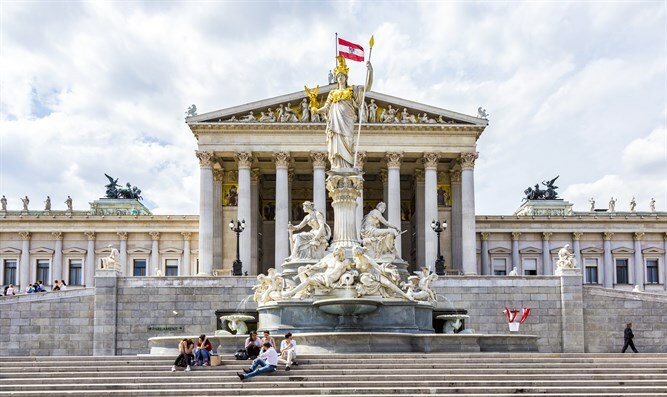 Sunday's election is the first since the FPOe became junior coalition partners to the OeVP in December under Chancellor Sebastian Kurz, obtaining the interior, foreign and defense ministries. Despite its leadership saying it rejects all extremism and its leader Heinz-Christian Strache visiting Israel, Austria's main Jewish organisation the IKG earlier this month said it refused to meet FPOe ministers. The party was formed by former Nazis in the 1950s and Strache, 48, now vice-chancellor, dallied with neo-Nazism in his youth although he now says this was when he was "stupid, young and naive."